Pre-seasoned so it’s ready to go right from the start, the 5 qt. 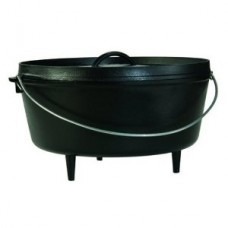 Lodge Deep Dutch Oven provides durable, reliable performance for all your campsite cooking. 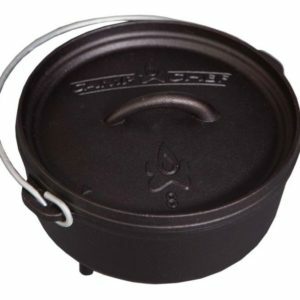 As versatile and convenient as other Lodge camp ovens, the Lodge Logic 5-Quart Cast Iron Deep Camp Dutch Oven sports a deeper design for more cooking capability. This portable cast iron pot can handle all your camp cooking needs, thanks to its specially-designed flanged lid that holds hot coals for all around cooking and inverts for use as a stand alone griddle. This traditional campfire cooker sports integral legs that allow the oven to sit perfectly over the hot coals of a campfire or fireplace fire. Convenient five quart size measures 10” across and 5” deep. 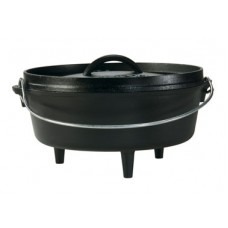 Its seasoned cast iron construction means the pan is ready to use right out of the box. Simple wire bail handle for easy carrying. 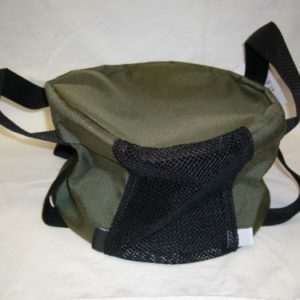 Dutch Oven Tote Bag 10″ 4 qt. & 10″ Deep 5 qt.